Custom Made In 14k or 18k Yellow or White Gold, With Diamonds Or Other Gemstone Options. Available In All Ring Sizes. A man engagement diamond ring would not be a cheap jewel and that is the main reason why you should ensure that you get, the best value for the money you pay. There are many aspects that combine together and make a great diamond engagement ring for men. At Kaisilver we have done intense research into the habits and lifestyles of modern men. The findings from this research are incorporated into all our designs. We do not compromise on anything and do not expect you to compromise either. We are the world's largest online provider of high end custom jewelry. All jewelry can be custom made in 14k or 18k white or yellow gold with gemstones of your choice. We do not mass produce jewelry and each piece is worked on by some of the world's best craftsmen. 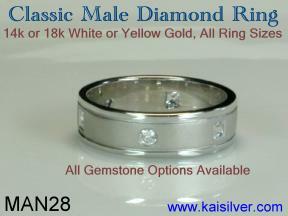 Your man diamond engagement ring will have flawless handfinishing and can be made with diamonds or any other gemstone. You can even choose to combine diamonds and other gem stones in this stunning engagement ring with diamonds for men. This man engagement ring with diamond is not mass produced, each ring is handled by some of the world's finest craftsmen and great attention is given to even the smallest detail. Our craftsmen and designers will work together with you in finalising the exact requirements of your ring. Since each diamond ring is completely custom made, all design modifications are possible and you need not limit yourself to what you see on our website. Order your man diamond engagement ring with the gemstone of your choice and also choose yellow or white gold according to your preference. Our jewelry weighs around 50% to 60% more as compared to what others offer for similar designs, this adds to the long term durability of your engagement ring and also keeps the gemstones and diamonds firmly mounted. Do not go for cheap alternatives where light weight junk is peddled in glamourous advertising campaigns. These cheap gimmicks soon turn out to be very expensive as you end up spending hefty sums on repairs and maintanence. When you shop for your diamond man engagement ring or, shop for any other jewelry, you will realize that no other jeweller offers you the high degree of flexibility that we do. With a base of skilled craftsmen that exceeds 3,500 and a team of 7 top designers drawn from 5 nations, you get true high end jewelry that no one else comes near to. We follow some of the strictest quality control standards and every gemstone that we use is handpicked and custom cut by experts. Kaisilver is networked to all the leading gemstone producers in Thailand and a few other countries, this gives us direct and preferential access to over 200 million carats of quality gemstones. You can even send us images of your favourite designs for us to custom make, and our team of designers and craftsmen will work together with you on all aspects of your jewelry. We do not indulge in gimmicks like close out and blow out sales where, light weight junk fitted with reject quality gems and substandard craftsmanship is peddled in the big department stores and shopping channels on TV. It is only the big names that seem to get away with such tricks and gimmicks which seduce innocent buyers through mind boggling advertising campaigns. If you are impressed by those glossy brochures and flyers and are amazed at the sleek advertisements and carpeted stores, then remember that all those overheads finally add on to your jewelry price tag! The MAN28 man diamond engagement ring is an excellent choice for special occassion rings. The design can include any gemstone of your choice and is suitable for both men and ladies. The ring provides a majestic look at a modest price and will surprise anyone who thought that, all diamond engagement rings would have an extravagant price tag. The design for this diamond engagement man ring is ideally suited for making a matching pair of rings. The man's ring can be as shown in the image here and for the lady's engagement ring, use a slightly narrower band. Like we mentioned above, the same man engagement ring design can be ordered with other gemstones instead of diamonds. You could for example choose, rubies, sapphires, emeralds, tanzanite, aquamarine, pink tourmaline or green tourmaline and even the lower price range gemstones like blue topaz, amethyst, citrine etc. With the gemstone options you can probably go for much larger gemstones and thereby increase the overall bandwidth of your man engagement ring. The options are endless and it would be best if you allowed us to work out a solution as per your preference, send us the details at sales@kaisilver.com and we will together find the right combination. We do not do any hard sell gimmicks and it has always been our policy to keep the buyer well informed and then allow them to make a decision. We will mention a few things about this classic man diamond engagement ring. Firstly, the band width is a good 8mm and this is a comfortable width. A very narrow band width would not look very masculine and a band width beyond 10mm would appear uncomfortable for some, especially if the ring is worn regularly. If you decide to replace the diamonds with gemstones, the larger gemstone size could make the band width around 10mm and this is as far as you should go. This is just a suggestion and we will finally go by your personal preference. Now let us move to the dull finish on the band of this man engagement ring with diamonds. The middle portion has a dull sandblasted finish and the rims are high polished. This is a matter of personal preference and you might want to use a high polish finish for the entire band, the total customization that we provide accomodates all types of preferences. Notice the thickness of the gold around the band, it is a good 1.5mm and does not appear like a thin sheet of metal ready to scratch or cut your finger. The good gold weight of these man diamond engagement rings allows us to construct a sturdy and durable ring that will not bend and twist at the slightest impact. Design Tips: Our designers have put together an interesting list of options and possibilities for your men's diamond engagement rings. These are mere suggestions and you can add your own preferences and priorities based on likes and dislikes and also your budget range. (01) The band of the ring can be left as it is with a dull sandblasted finish or, be made with a high polish look. You can also switch the design by using a dull finish only on the rim of your diamond man engagement ring and keep the middle portion as high polish. (02) If you are looking for a wider band, then consider replacing the diamonds with other gemstones. The larger gemstones would be cheaper than diamonds and also allow the band to increase in width to around 10mm to 15mm. Ofcourse, if your budget permits go for larger diamonds of around 4mm by all means. This would add a significant amount to the price tag and look absolutely smashing. Email us your ideas and our team will work with you on final specifications. (03) You have an unlimited choice of gemstones to choose from. You could for example combine the gemstones of you and your fiance in the same ring. 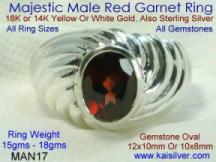 The round gemstones could be your birthstones and the square gems could be the birth stone of the lady. Depending on your budget, you can also alternate the gems with diamonds and replace only the round or square diamonds with other gemstones. This will once again lower the cost of your engagement diamond ring for men and we can work out exact price details for you. The ring can also be made as a family birthstone ring with the birthstone of each family member set in the ring. (04) Also consider the two tone gold option where, yellow and white gold are combined in the same ring. Your man engagement diamond ring could have white gold in the center portion of the band and use yellow gold for the rim. The gold colors could ofcourse be switched, with white gold being used only on the rim of the band. This combined with the dull sandblasted or high polish finish allows for a whole new range of exciting options. 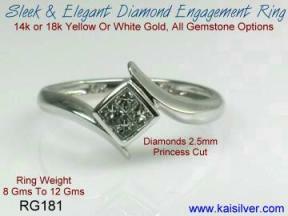 (05) The design of this diamond engagement ring for men is such that, it can be used for a lady's ring too. For this reason it is very suited for an engagement ring pair where the lady's ring could be made a bit narrower and with smaller diamonds. Matching engagement rings with same design for the lady and the man are getting to be quite popular these days. You can add significance to your diamond engagement ring by using birthstones in the rings. The lady's ring can have the birth stone of the man and vice versa. We have compiled a detailed and comprehensive list of birthstones gemstones, You can see the charts below and choose the gemstone for your ring. (06) You can request for just about any design modification that you fancy and this includes, shape and size of gemstones, the number of gemstones and also the complete design of the ring. You can even provide us with your own design for us to custom made. Gemstones can be combined in any combination that you like and you need not limit yourself to the gem stones that you see on our website. Your diamond man engagement ring has 3 square diamonds and 3 round diamonds. The diamonds can be ordered in sizes of 3mm or size 2.5mm. The diamonds are genuine, good quality white diamonds. For other sizes please request us for a specific price quote. All details and queries can be emailed to us at sales@kaisilver.com and will be answered by a team of professional designers and craftsmen. All ring sizes are available and you can also request for an engraving inside the band. Please limit the number of alphabets to be engraved to 8, as cluttering up too many alphabets would make them small and unreadable. The band width will range from 7mm to 8mm depending on the size of the gemstones or diamonds. For the 3mm gemstones the band width would be 8mm and drop down a bit to 7mm for the 2.5mm size gemstones. Let us know if you need the band width to be broader than 8mm and we will suggest the size of gemstones, that would look good for that width. 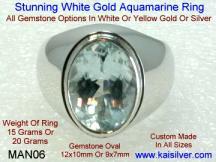 You can also combine gemstones or combine gemstones and diamonds in the same engagement man ring with diamonds. Provide us with details of your specific requirements at sales@kaisilver.com and we will work out a price quote for you. Dull Or High Polish Finish: The image shows a man engagement diamond ring with a dull sandblasted finish on the center of the band and with high polish towards the rim. You can choose to have a complete high polish band or reverse the portions with the dull and high polish portions. Let us know if you need a completely different type of finish for your diamond engagement ring. Gold Weight: The minumum weight of this diamond men's engagement ring would be 15 to 20 grams. In cases where you need a very large ring size we will inform you of any additional gold weight that might be necessary. The price remains the same for white gold or yellow gold and even a two tone gold option is priced the same. We recommend 14k yellow or white gold because of it's hardness but the final choice is always yours. We have a whole section devoted to diamond engagement and wedding rings. All these rings can be ordered in 14k or 18k white or yellow gold with gemstones of your choice. You can even combine diamonds with other gemstones or choose to completely exclude the diamonds from your rings. Click for more diamond engagement rings Every ring has high end craftsmanship and good gold weight. This provides added long term durability to your engagement or wedding diamond rings and reduces the need for frequent and expensive repairs. 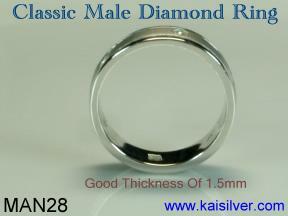 Kaisilver was the first online provider of high end men's rings. Our rings combine good style and design with immaculate craftsmanship. With direct and preferential access to over 200 million carats of quality gemstones, we provide you with a mind boggling array of options. Each gemstone is hand picked and inspected by experts and no low quality gemstones are used. Every design is the result of an intense study into the life style and habits of modern men. Good Design: If you buy your man diamond engagement ring or any other jewel from Kaisilver, you will realise what good design is all about. For most sellers good design is all about good looks and nothing more. 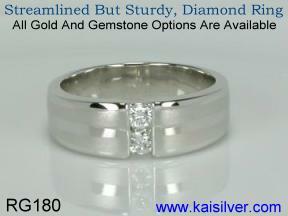 At Kaisilver good design also includes suitability of the design for wearing conditions. A diamond man engagement ring good design would also mean that the ring is sturdy and durable, as this is an important factory for today's active males. Craftsmansip Without Compromise: The days of mundane men's rings with haphazard craftsmanship should have disappeared a long time ago. However, many jewellers still push low grade craftsmanship for male jewellery. At Kaisilver jewelry is not mass produced and every jewel is individually worked on by some of the finest craftsmen and artisans. Flawless hand finishing is done in the final phase of production. Strict quality checks are applied at every phase and we do not expect you to compromise on anything. World's Largest Gemstone Resources: We are networked to the world's largest sources for gemstones and in most cases gems are procured directly from miners. Over 1,000 skilled gemstone cutters custom cut all gemstones that are used in our jewelry. 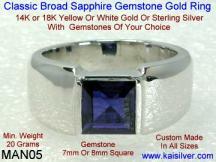 Should you need any gemstone not mentioned on our website please email us at sales@kaisilver.com with details of the gemstone and we will procure it for you. Extra Weight: Your man engagement ring with diamond is a special occassion ring and you will surely expect it to stay in shape for many years to come. For this, you will need a healthy gold weight which in turn will keep the gemstones and diamonds firmly mounted. Healthy weight will also ensure that your engagement ring will not bend and dent out of shape at the slightest impact. Our jewelry weighs at least 50% more than what other jewellers offer for similar designs. Jewelry That Lasts: Cheaper jewelry is light weight, and also has a short life span. Your man diamond engagement ring has a good weight and a streamlined design. Cheap jewelry is cheap only in the short term as expensive repairs and maintanence costs will soon add to the initial cheap price tag. The durability factor of your diamond men's engagement ring is built into the design and is then executed by providing healthy gold weight. Expert Guidance And Advice: All your queries and doubts are cleared by a team of designers and craftsmen. You will not be pressurised into making an impulse purchase at Kaisilver. We encourage our buyers to ask more questions, discuss more options and then make a decision based on all the information that is provided. Our straight forward explanations have given us a solid reputation in the jewelry and gemstone trade. There will be no hard selling at Kaisilver and the information we provide is true and might even result in us losing an order or two. We are always on your side and will never compromise on quality of craftsmanship or merchandise just to get your order. High Level Of Buyer Confidence: Our buyers include fashion models, TV news readers, lawyers, scientists, members of the U.S and U.K armed forces, owners of resorts and hotels and people from all walks of life. Buyers have been surprised at the high quality of merchandise and service that we provide. Our efforts to bring back the human touch to online selling have been appreciated by over 5,000 buyers in 17 nations. Firstly, we are in no hurry to push you through the ordering process. Browse as long as you wish and get all your doubts and queries answered. All queries and orders can be emailed to us at sales@kaisilver.com An extremely skilled team of designers and craftsmen will answer each query. The idea is to allow you to make a well informed decision. Payments are accepted through Paypal and Western Union Money Transfers. If you are buying from Kaisilver for the first time, please use paypal as most first time buyers feel that all sellers paid through Western Union Money Transfers will run away with their money! We are International Verified Premium Account holders for paypal and you can therefore transact with confidence. Our email for paypal is info@kaisilver.com Please let us know if you wish to use, any of the other payment methods mentioned above and we will provide you with details for the same. Shipping is by EMS or FEDEX and can be tracked on the web. The shipping charges are 25 U.S$ worldwide. Shipping will be within 4 to 5 weeks of order confirmation and receipt of payment. The merchandise would reach you in around 4 to 5 working days after the date of shipment. Men are not very fussy about their engagement rings and this is probably the reason why, sellers care little about design and style when it comes to men's engagement diamond rings. The MAN28 ring comes as a refreshing change with a design that has been well researched and excellent craftsmanship. This man diamond engagement ring takes into consideration the habits and active lifestyle of today's man. The ring with a good gold weight and streamlined design is sturdy and durable. The classic design of this diamond engagement ring for men uses diamonds that are of size that is neither very large nor very small. Diamonds prices grow exponentially as the size of the diamond increases. This means that diamonds of the same quality would be priced higher per carat (weight) if the size of the diamond is larger. A men's diamond engagement ring with larger diamonds would also need to have better quality diamonds (not just larger) as, larger diamonds are more likely to have visible inclusions and flaws. The larger diamonds would drive the price tag high and be out of the reach of most of us. Our designing team worked closely with our diamond experts to design an engagement man ring with diamonds that, would look awesome and yet not have a prohibitively high price tag. 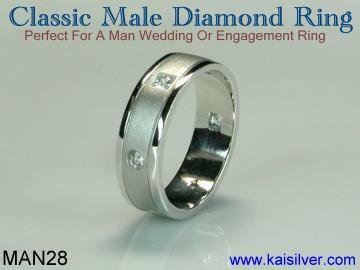 We can also custom make man diamond engagement rings with large diamond sizes if that is what you prefer. Send us details of your requirements and we will work out a specific price quote for you. Remember that men's jewelry should always give equal emphasis to good style and good durability. Few jewellers would provide such frank advise, but it is something that you will learn few weeks or few months after you have purchased your man diamond engagement ring.